In conditions hardly conducive to fast-paced, attacking rugby, both sides had to dig deep in the rain and it was the home team who prevailed in this hard-fought encounter, writes Jennifer Bates. Hartpury were hoping to back up their improved display against Ealing Trailfinders a week earlier and establish some sort of momentum over the remaining games of the opening ‘phase’ of the Championship season – all teams will be involved in the newly-created Championship Cup competition during a six-week window through November and early December. Consistency in selection is part of that process and Hartpury were able to name the majority of the squad that performed well last weekend. Skipper Simon Linsell made a welcome return following a shoulder injury, while the experienced Luke Eves was available to return in the midfield. Prop Joe Morris traded his place on the bench with Rupert Harden and there was a shuffle in the back row, where James Dun and Iain Grieve were both unavailable following knocks last week. Mat Gilbert and James Stephenson joined the starters, with Tom Pashley coming onto the bench alongside Angus Southon, whose Championship debut was reward for strong performances in Hartpury’s BUCS Super Rugby team. Nottingham were hoping to get back to winning ways, after a run of wins had been interrupted at Cornish Pirates last time out. Neither side were helped by the rain which, having fallen steadily for hours before the game, continued with only a brief respite around half-time. Inevitably, handling was made difficult and many players even found it difficult to keep their feet on a slippery surface. Nottingham made the stronger start, but the only scoring in the opening quarter came from an early Shane O’Leary penalty. Two tries in quick succession were to give the Green and Whites a control of the game that they were not too relinquish. Jordan Coghlan made a big bust through the midfield giving, Nottingham field position close to the Hartpury line. Hartpury defended doggedly but when the ball was whipped to the right their was plenty of space for winger Jack Spittle to finish in the corner. Spittle was involved again two minutes later. Despite what looked like a clear knock on earlier in the move, Nottingham were able to put together multiple phases before the ball was again moved wide right. Spittle made ground before a good inside ball put supporting full back, Sean Scanlon, in the clear. A further O’Leary penalty made it 18-0 at the break and when he repeated the dose early in the second half it looked to be all over for Hartpury. However, they did rally and with Nottingham prop forward Rory Burke in the bin, it was back row forward Rob Langley who drove over from an attacking scrum to open their account. However, a comeback never really looked likely and the result was confirmed when flanker Coghlan peeled off a maul to score with three minutes remaining. Hartpury have now lost five of their seven Championship fixtures and remain anchored in the bottom two of the table, with only Yorkshire Carnegie beneath them. 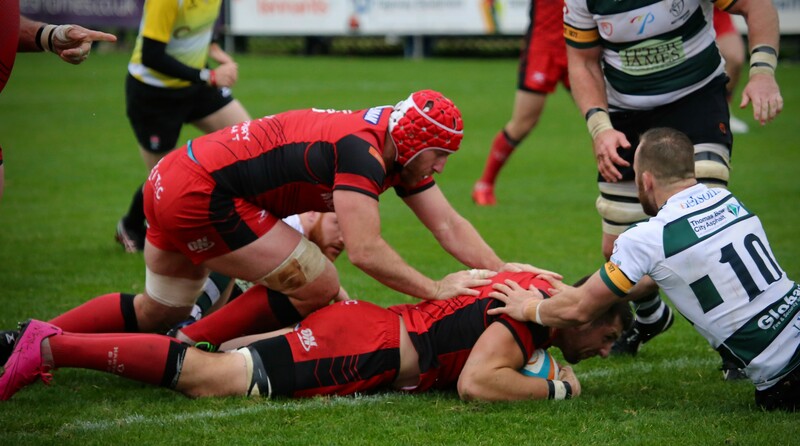 Next Saturday sees the visit of Jersey Reds, with whom Hartpury had two close-fought tussles last season (2.30pm). Nottingham: Scanlon (Try 28), Spittle (Try 26), Peters, Lyons, Robinson, O’Leary (Con 27, Pens 5, 38, 42), Veenendahl; Sio, Cole, Burke, Dolan, Qualter, Buckley, Coghlan (Try 77), Poullett. Bench: Farnworth, Jack, Heffernan, Cecil, Cox, McConnell, Williams. Hartpury: Wilcox, Henry, Seabrook, Eves, Foley, Leeming (Con 59), Bolt; Murphy, Tanner, Morris, Craig, Linsell, Langley (Try 58), Stephenson, Gilbert. Bench: Stratford, Merrey, Harden, Southon, Pashley, Cochrane, Cozens.